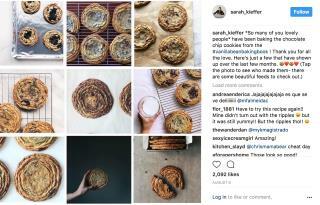 (Newser) – "It's all in the pan-bang," baker-blogger Sarah Kieffer says of her unusual chocolate chip cookies. The Minnesota baker's not-so-secret recipe had already been circulating on Instagram when the New York Times tested it out, and after the Times covered it, it went viral. Kieffer detailed her technique after food writer Julia Moskin became intrigued by the attention the funny-looking cookies—"as wide as a salad plate and flat as a flounder"—were getting online. She assumed the "mutant" cookies copied by food blogs were a "cry for help," and she sought out the creator. Kieffer didn't hold back, revealing how she makes the unusual ringed edges by opening the oven after the cookies have slightly risen and giving the baking sheet a good slam on the rack or on the top of the oven. She repeats the whack a few times more during the baking process, sending ripples fanning out from the center. Bang them like you are an Amazon movie executive? so many different kinds of CC cookies. In Canada they have a brand called Dad's, which is a shortbread CC cookie. i have one type in Australia what was a in a blue bag, can't remember the name, but was great.